Facebook is not just gaining more and more reputation but also changing as per the new generation and their choice, Facebook Graph Search is awesome and here we go new redesigned News-feed for Facebook. Facebook graph search provided awesome experience with real time and user friendly search for your friend, friends of friends and their choice/interest and all. After little time, Facebook announced new feature to be launch for beta testing, I love the preview Facebook has unveiled. As per Facebook, all your News feed will be more in your control and you can do a lot with it. In the upper right corner you can find the different category of feed clicking on which you can see selected newsfeed just alive. No need to refresh the page it will be alive. With such great control you will also notice enormous change in the layout not for the Desktop browser but also for all Smartphone and tablets. 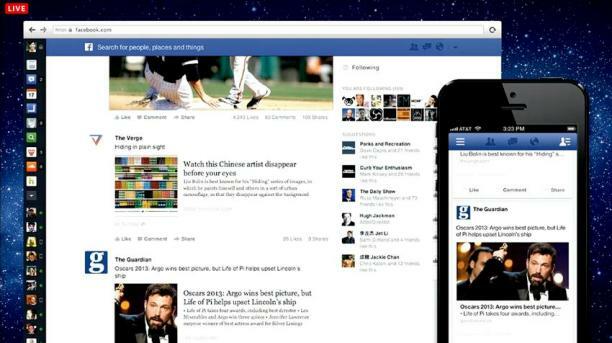 Engineer at Facebook took a lot research idea and finally comes out with this clutter free newsfeed. As it will be launch in beta version for Facebook enthusiastic people, you can test it if you wish. Larger thumbnails for photos, maps your friend have visited, awesome and larger preview of the links or video they’ve shared. It reminds me style similar to that of Google plus. Larger area for videos and links makes me amaze and looks pretty. May be this live page for newsfeed require higher speed internet, so for the normal speed user it may be nightmare to load. This automatic update will also keep updating the content even not clicking refresh, for mobile user, Data charges will be greater even if you don’t wish to. What if you are reading some updates and it scrolls down every time automatically when new feed arrives. And also you can request to test the beta version first in your friends circle. Have great time people, share this with friends and keep enjoying.